Hi there and welcome! If you are new to Old House to New Home then let me catch you up! Two years ago my husband and I bought a realllyyyyy old home that we are slowly transforming into a space we love. If you are a regular reader then you may be wondering what we are doing here today. I have recently joined a great group of women bloggers who are super supportive and talented. I absolutely love seeing their DIY projects and crafts, so when we all decided to put together a summer home tour, I was excited to participate. On the graphic above you can click any of the blog names to check out the other home’s participating. If you love peeking into people’s home then today is perfect for you! Browse around a little and show these talented ladies some love! So my home doesn’t scream summer by any means, and I still have my spring art up, but we do have a few summery touches, such as our porch furniture out! Our front porch gets a lot of use because we don’t have one in the back (yet!) and my daughter loves to be outside, so we hang out here after dinner many summer nights. It is so quiet and peaceful, although it does need a new coat of paint! I picked up this antique chair, alphabet rug, and lanterns at a garage sale last weekend and think they add the perfect amount of charm to our front porch. Off the front porch is our foyer. It is one of my favorite rooms in the house but I am really itching to change the paint color. I painted it soon after moving in and am now feeling much lighter and brighter colors. I still like this color, but think the room would really shine with a light gray paint. The light that shines through our front door makes me so happy. Often, the light coming through the leaded glass makes rainbows on the floor that are just so pretty! I recently took down the big gallery wall that I had here on the stairway wall. It was just too busy and not coming together how I wanted it to. I went with a simpler look with just four pictures of my daughter that I love. This rustic industrial table in the corner of the foyer is one of my favorite pieces of furniture. I love the top here that holds this adorable leather trunk from HomeGoods, an old fashioned lamp that I rescued from my parent’s trash pile, and our wedding guest book made up of engagement pictures. The candle holders are thrift shop finds that I spraypainted bright gold. I am so glad that mixing metals is in because I love the mix of metals on this table. Through the foyer is the kitchen and this brand new bench that I picked up at a garage sale last weekend. I am seriously obsessed with this big chunky boy. This hallway used to house my made over HomeGoods bench with no sew cushion, but I really think this beat up reclaimed wood bench is much better suited here. It wasn’t the cheapest garage sale find, but I am so happy I decided to get it. It needs a good sanding and a lighter stain color, but for now, it works perfectly in the space. This hallway from the kitchen to foyer houses my absolute favorite kitchen sign and DIY Wooden Clip Boards. I have a thing for hallways and wish this house had more of them. They are such good spaces for decorating with objects that you love. Since you walk through them so often, I think it is important to only put pieces here that you truly love. The other side of the kitchen has gotten some new canisters in the corner that hold sugar, flour, and cookies (all Martha Stewart Line from Macy’s) and the top of the cabinets now hold vintage silver trays that were given to my Grandmother at her wedding. I love the antique touch they add to the kitchen. I have mentioned many times here before that the finishes in the kitchen are definitely not my first choice. The kitchen was remodeled in the 90’s and is definitely dated. There are so many things I want to change here but we know the expense will be crazy, so this remodel won’t come for many years. So let’s stick to the positives and focus on what I do love. The amount of space we have is fantastic and I love the wooden beams that the previous owner added. We just recently updated the recessed lighting to new LED fixtures and I love how white and bright they are! The dining room is through a swinging door in the kitchen. This room is in dire need of a makeover. We just plopped our furniture down two years ago and left everything else as is. I would love to paint it a new color and add some more personal touches. We need a bigger table, too. I hope to make this room over sometime this year, although priority wise, it is pretty low right now. If you kept going to the left you would end up in our living room which was way too messy to share today, but you got to see most of our main floor and maybe one day I will get my act together and share the other couple of floors we have. Or maybe I shouldn’t sound so ambitious and just stick to sharing our main bathroom remodel that I promised months ago! I hope to have that ready by the end of the week. I hope you enjoyed the tour and that you check out the other blogs on the hop! Remember that you can click the blog’s’ name in the graphic at the beginning of the post! On your way out, check out my adorable new mat from Target!! DIY Fall Welcome Sign from an Old Rake! I love your home! I have always had a soft spot for older houses, and with a big front porch. This is a beautiful home! I love all of the rustic and rough pieces in your home. It all ties in so well. 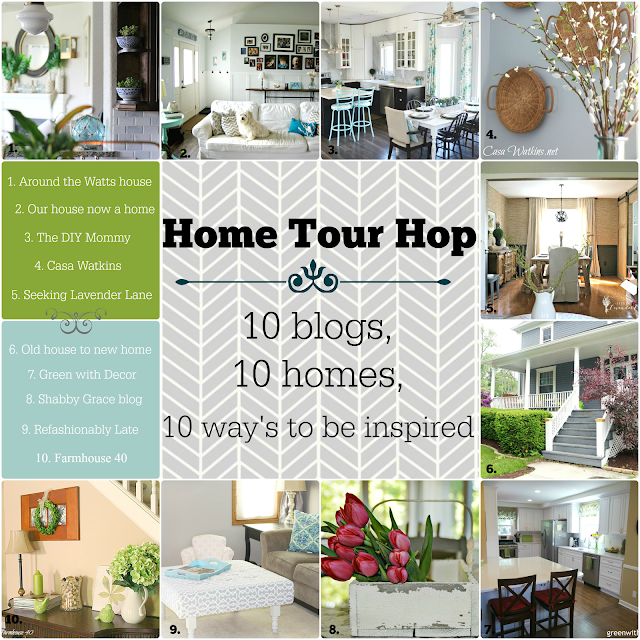 Thank you so much for taking part in the home tour hop! Thank you! I love old ones too!! What a wonderful older home you have. Such beautiful woodwork and front entrance. I love older homes and all the character they have. You have done a beautiful job decorating. Thanks for the tour. Thank you! I am an old home lover too and the woodwork and front door definitely sold me the first time we saw the house! Your home looks great!! I love the warm, cozy feeling throughout. My favorite is the kitchen feature. I have been trying to finish my board for a while. Thank you!! I love to create warm and cozy spaces so I am glad it looks that way in the pictures! Your home is beautiful! I love your kitchen sign and your porch is so cozy and inviting! Thanks for being a part of this home tour with me! I’m so honored to be sharing this journey with all of these amazing bloggers! Thank you!! The kitchen sign is definitely one of my favorite pieces! Amanda, your home is beautiful! Thank you for sharing the tour with us! Thank you, it was fun!! I loved seeing your house as well! Totally crushing on your home! All the woodwork, beautiful doors and moldings! OMG! I also love the floor in your kitchen! You’ve done an excellent job. The bench too you just picked up, supa cute! Thank you Sara!! We love the woodwork too!! Hi! I am new to your blog and I am loving the work you have done to your house. It looks like a wonderful place to call home. Thank you so much! I am glad you stopped by and hope you continue to! Love your house!! The front porch looks so comfy and cozy – I of course love the green chairs! Thank you Meg!! I don’t decorate with green often, but when I do, I love it to be bright and cheerful! Thank you Christine, it definitely has that vintage old-world feel. An old home has its challenges, but you definitely can’t replicate the charm we are blessed to have in our home!! One of my dreams is to work on a heritage home. Your is just beautiful and you’ve done such a great job with it! It’s just so inviting and I love all of the paint colours you’ve chosen. Thanks for sharing!